After a fiercely contested bidding process, which involved President Obama’s pitching in on behalf of US aerospace firms, the Indian government has announced the finalists in the competition to supply it with 126 next-generation fighter jets. 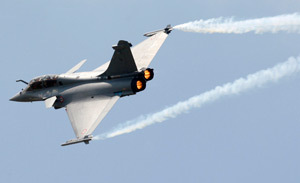 The Indian government shortlisted two European jets—the Rafale fighter from Dassault and the Eurofighter Typhoon, made by a consortium of European companies. The $11 billion contract is one of the world’s largest military acquisition programs. However, although it disappointed the US bidders Boeing and Lockheed Martin in the allocation of the fighter contract, the Indian government’s cabinet committee on security is expected to approve the purchase of 10 of Boeing’s C-17 Globemaster-III heavy lift aircraft. This contract, worth $4.1 billion, will likely be awarded soon. India also recently ordered 12 P-81 Poseidon maritime patrol aircraft worth $3 billion and 6 C130J “Super Hercules” strategic lift aircraft worth $1.2 billion from US companies, cementing the importance of US aerospace companies in India’s massive modernization of its air force. Matching its push to modernize the military, the Indian economy continued to expand strongly in the final quarter of the fiscal year 2011 (India follows a March-April fiscal year), despite higher interest rates and slowing consumer demand. The Index of Industrial Production (IIP) released for March 2011, showed that industrial production overall grew by 7.3% year-on-year. In the month of February 2011 the growth in IIP had moderated to a much slower 3.6% y-o-y before bouncing back in March. While the figures are strong, they are a decline from the preceding year (2009-2010), which saw a growth rate of 10.5%. The manufacturing sector was a big contrbutor to the strong IIP growth, increasing by 8.1% year-on-year in March. However, in contrast with the strong industrial production numbers, the consumer sector is seeing the impact of inflation and higher interest rates. Year-on-year growth in March 2011 for consumer goods manufacturing moderated to 7.7% in March versus 11% in February, and growth in consumer durables moderated to 12% as compared to 23% in February.